What will YOUR Fortune Be? Do you wake up in the middle of the night wondering if your latest big business decision was the right one? It’s time to put your worries to rest and get some more sleep, because a new, easier, better way of doing business is on the way! Find Clarity with your Inner Team. As business owners and entrepreneurs, it’s up to us to make all the weighty decisions involving our business, and sometimes the number of choices we are called on to make per day can be overwhelming! Take the guesswork out of business decisions both big and small by learning to be an Intuitive Entrepreneur. Stop those middle-of-the-night conferences called by your Inner Critic! Get your questions about the role and benefits of using Intuition in Business answered in the Akashic Records! What Powerful Information + Tools Are You Missing Out On? 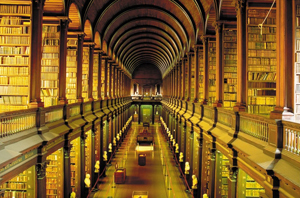 Discover the beauty of the Akashic Records for Business Applications! Wait… What are those AkashicRecords again? The Akashic Records are an ethereal library containing all the information there ever was or ever will be about every person, place, thing, date, idea, or institution.Yup, pretty mind-blowing! The informationavailable in the Records is both infinite and precise, and you always get exactly what you ask for. Whenever you get an intuitive hit, a gut feeling or experience déjà-vu, that’s your Akashic Records talking to you. Experience the Magic of the Akashic Records on this teleseminar which includes a live channeling and see for yourself! Which Will You Choose? How Is Following Your Head Working For You? Isn’t It Time for a New Direction in Your Business? Elizabeth Locey, Ph.D. is in the business of making your business soar. If you need help finding your niche, discovering your unique gift, connecting purposefully with ideal clients, or generally making a bigger splash in the world (not to mention having extra cash in your pocket), you’ll want to get on her calendar. Her thoughtful, loving presence walks you through a trip to your Akashic Records from pre-consultation assistance with crafting perfect questions to post-consultation strategy session. She left a successful academic career to help Bright Lights whose mission it is to make the world a better place to succeed brilliantly. Intrigued? Click here to find out more. “This opened a much BIGGER picture for what the future holds for me.